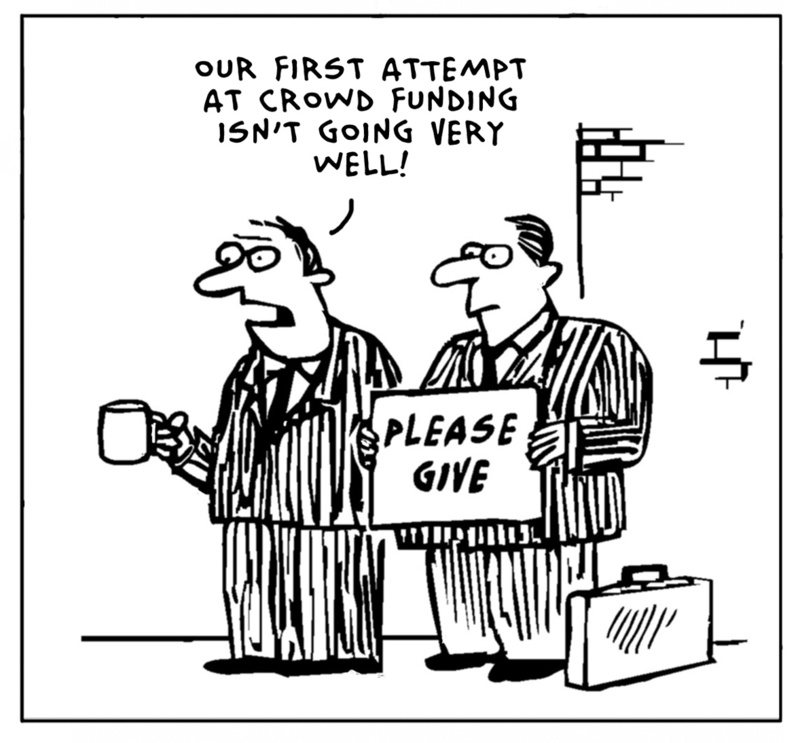 Crowdfunding is on everybody’s tongue these days. It’s a $5+ billion industry, and everyone from companies to non-profits to some random shoe salesman in the UK who wanted to bail out Greece are using it. And a lot of people are using it wrong. Put Together a Plan, For Goodness Sake! Anyone can tell a half-baked crowdfunding plan: the kind that is born one late night over drinks and then launched the following Monday. Your drunken quest to crowd-fund the World’s Largest Rubberband Ball To Achieve World Peace will likely end up in the graveyard of dead Kickstarter campaigns – and leave your handful of funders angry or disappointed with you. In some cases, crowdfunding campaigns that raise money but don’t do what they promise can be legally liable for funds secured as well as other damages. So make a plan. Most agencies, including ours, recommend that you start about 3-4 months in advance: (1) summarize clearly your idea, (2) start reaching out to potential supports privately, (3) research similar failed/successful crowdfunding campaigns in the past, (4) budget out your project clearly, and (5) build a team around you of dedicated volunteers or paid staff to make it a reality. It Takes (Some) Money to Raise Money. It’s probably true that for small campaigns (under $5,000), you could get away with volunteers. But as in all projects, volunteers are only as reliable as their work and other schedules allow them to be. Plus, paying people up-front for helping you raise money, rather than promises of payment later (aka deferred fee arrangements), is the right way to treat people. It incentivizes folks to work hard by valuing their work up front, and makes them more likely to be vocal supporters of your project in public. If you are actually broke and don’t have funds to start a crowdfunding campaign, consider postponing the campaign for a few weeks while you approach close friends/family about donating to a pre-launch campaign fund. If people ask you why you need money to start a crowdfunding campaign, explain to them the many costs of the campaign: design, marketing/outreach/promotion, the prizes, launch/completion events, not to mention your time and skills! You should make it clear to these “pre-donors” that even if your campaign is fixed funding (meaning if you don’t reach the goal, your donors get their money back) their pre-donation is not refundable. Obviously, this is because you will have already spent it by the time the campaign succeeds or fails. Everyone Wants to Donate the Last Dollar, But Not the First. Nothing stinks more than reaching a crowdfunding page only to find out it has zero (or one, or two…) donors. Unless your funders are part of the small minority of so-called first adopters who’ll back something just because they’re the first to do it. Most people in the world won’t eat in a restaurant if there’s nobody else in it, won’t boogie down on a dance floor if it’s empty, and won’t throw their money into your dreams if nobody else is doing it. Plus, people love to be the last donor: they can say they pushed this campaign over the finish line! That’s why there will undoubtedly be a mad rush of donations at the end of your campaign, and you may raise 30% or more of your funds in the first and last days, each. The down-time in the middle is when you (and your team) have got to build and reach out deeper and deeper into networks. For the first day, though, you should already have at least a dozen of your close friends/family ready days or weeks in advance to hit the donate button. These folks will take the dangerous first steps with you, and then you can promote your campaign more widely to extended networks and even press. Still have questions? Give us a call/email and let’s talk more about working together to make your campaign a reality.